When my parents were young and just married, they were very fond of Greco Roman Antiquity, and living in Tunisia they had a lot of Archeological sites at their disposal. Their favorite place to go was Thuburbo Majus where they used to make archeological excavations. Usually they would only find potteries or coins but it was their joy. I’ve built this quilt from one of my pictures taken when visiting the place with them several years ago. I wanted this piece to be a peaceful memory and a representation of my parents’ love. Hand dyed and commercial fabrics – rusted fabrics – Shiva paintsticks and freezer paper – hand dyed thread and nylon invisible thread. For the background, the stripes are shaped and sawn with the Katie Pasquini method ( the border of the fabric is turned under with a cardboard template and starch), then the stripes are sawn together with a zigzag stitch and a nylon transparent thread. 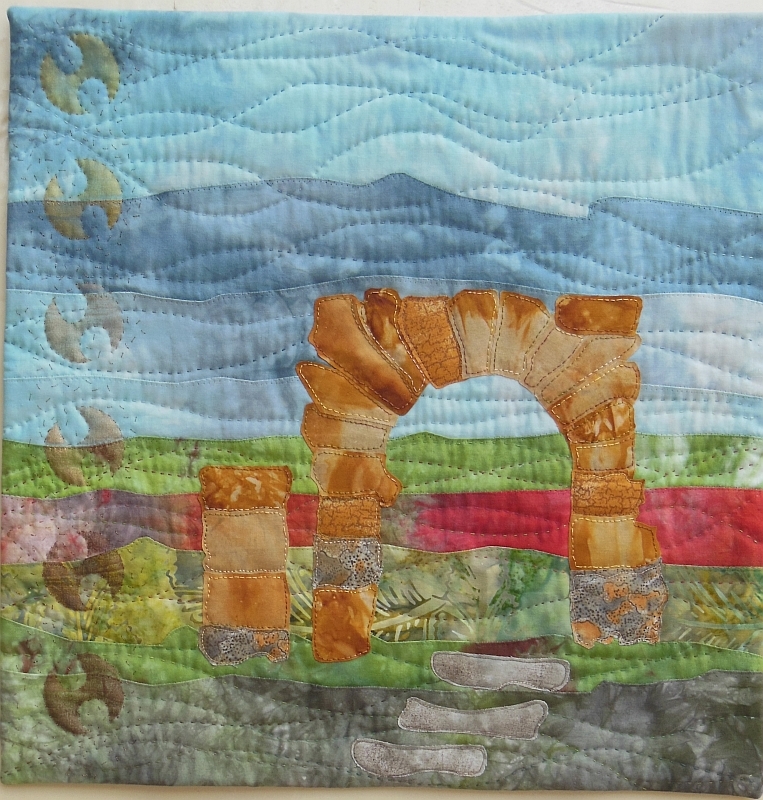 The fabric used for the antique arch is a piece of rusted fabric I made. But a had a serious problem with it : probably because I didn’t washed it enough it was too stiff and it was just impossible to machine stich it ! the needle wouldn’t perforate the fabric ! I had to do it by hand with back stitch. The stencilled shapes are a reminiscence of the potteries or other objets they would discover when digging. 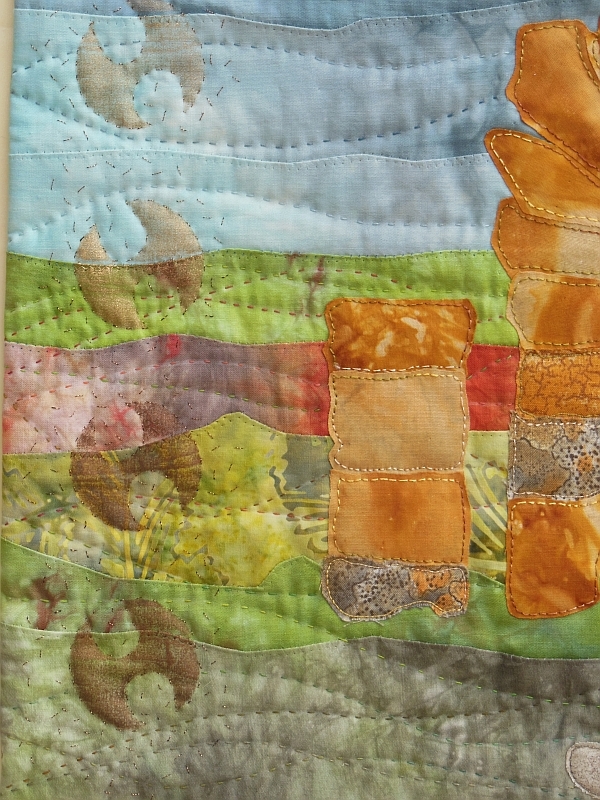 The quilt is hand quilted with free lines and hand dyed threads, it is faced. Chantal, there are layers of memories in this piece…as in the sites your parents ‘excavated’, and the history and stories they’ve passed on to you…to pass on to the next generation. Treasures in more ways than one. Thank you! Dear Chantal, your quilt is eye catching with your subject, colours and techniques, wonderful.